Includes league and cup games. Thanks to ESPN for the raw stats. How many times have we heard comments like that coming from our television football match commentaries? Typically it is the ‘expert’ who makes the comment, an ex-player who through his prior experience is assumed to have a grasp of the tactical and analytical side of the game. Obviously the more shots a player has on goal, the more chance he has to score. But then again it depends on which part of the pitch the player is shooting from. BSports tells us that, so far this season in the Premier League, Sergio Aguero leads the field in converting shots to goals, with an exceptional conversion rate of 3.43 shots per goal scored. Loic Remy (3.60) and Luis Suarez (3.83) come close behind. However, even players of the calibre of Robin Van Persie and Wayne Rooney have needed an average of more than 6 shots for each goal. An excellent piece of research from different game reveals the average number of shots needed to score from the different areas. Their study involves more than 30,000 shots over more than three seasons in the Premier League. The diagram shows what one would expect – that it is easier to score from the green inner zone – with an average of 6 shots producing a goal. It is much more difficult to score from the amber zone where it takes an average of 18 shots per goal. In fact the stats show that Luis Suarez has had more than double the shots of Sergio Aguero from that area. Wigan Athletic’s Arouna Kone was the most successful in the Premier League last year in terms of turning his shots into goals from the amber zone. So far this season Latics have scored 72% of their goals within the green zone, 8% in the amber zone and 20% in the red zone. The three amber zone goals came from Jean Beausejour at Derby, Jordi Gomez at home to MK Dons and Marc-Antoine Fortune at home to Bournemouth. Latics have scored a paltry 30 goals from 27 league games. The ratio of goals per game is actually on a par with that of last season (47 goals from 38 games), although that was against far superior opposition. There were hopes among supporters that Dave Whelan would open up his wallet during the transfer window and sign an experienced striker with a proven goal scoring pedigree. In the event Latics let Grant Holt go on loan to Aston Villa and signed Nicky Maynard on loan. Both Owen Coyle and Uwe Rosler have been frustrated by players not taking enough advantage of goal scoring opportunities this season. It could be argued that there have not been enough genuine chances created and this is something Rosler will be working on. Rosler is also keen for the midfield players to support attacks by getting into the penalty box. They really need to get into that green inner zone more often. Ben Watson scored two crackers – a header against Maribor and a shot in the recent Crystal Palace cup tie – by doing so. Watson is the leading goalscorer from holding midfield with four goals. McArthur and Espinoza each have one scored from outside the box. McCann has one scored in the green zone. The current shots per goal ratio up to this point in the season makes interesting reading. Of the forward players Jordi Gomez has the best record with an average of a goal every 4.8 shots (6 from 29). He is followed by Nick Powell at 7.6 (10 from 76), Marc-Antoine Fortune at 7.3 (4 from 29), Grant Holt at 14.5 (2 from 29), Callum McManaman 26.0 (1 from 26) and James McClean 52.0 (1 from 52). 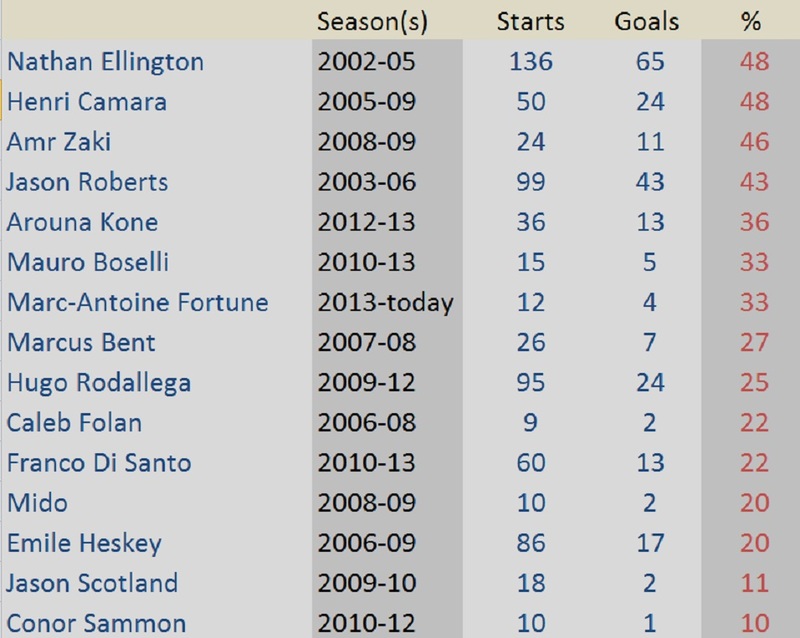 The table at the top of the page gives the ratio of goals scored to the number games in which a player started for Wigan Athletic forwards over the past decade. It includes league and cup games. There are some spectacular returns there. It is no surprise to see that wonderful scoring duo Nathan Ellington and Jason Roberts up there, with Henri Camara and Amr Zaki. Comparisons are difficult with Ellington never having played in the Premier League for Latics, Roberts only playing for one year. The Latics careers of Camara and Zaki were controversial and short-lived, but when they were playing they were the best goal scorers Latics have had in the Premier League. Up to this point in the season Powell leads with a conversion ratio of 40% (10 from 25), followed by Gomez 35% (6 from 17), Fortune 33% (4 from 12), Holt 15% (2 from 13), McManaman 11% (2 from 19) and McClean 5% (1 from 19). Listening to a television commentary on a Latics game we would surely hear comments such as “He should have scored” or “He should have done better.” The stats show that it is not as easy to score as some experts might think. The stats on Gomez make interesting reading. Three of his goals have come from the red zone (including two free kicks), two from the amber zone and two from the green zone (one being a penalty). However, he tends not to shoot as much as some. Within roughly the same amount of playing time as Gomez, McClean has had almost twice as many shots. Of Powell’s 10 goals so far, 5 were scored in cup competitions. All but one was scored within the green zone, with his goal from just outside the box against Rubin being the exception. Many of the names in the table at the top of the page are strikers who are Wigan Athletic legends. But if Powell continues to score at his present rate his goal scoring statistics will be right up there with them by the end of the season. With three of his four goals scored in the last five games, Fortune’s stats are looking better than they would have before. In three years at West Bromwich his conversion rate was around 10%, although he was sometimes played in wide positions. Moreover Fortune is a good footballing centre forward – he holds the ball up well and brings others into play. He leads in assists, with four to his credit. The stats suggest that – providing they get regular playing time, keep up their previous form and get in sufficient shots – the trio of Gomez, Powell and Fortune are the best bet for goals in what remains of the season.